Getting a business attorney for your lasting empire is one of the best ways to preserve it into the future. As there are countless risks to your business that no amount of foresight or planning can stop, having legal representation that works on your behalf can save you an incredible amount of money in the long run and make the continued survival of your business possible. Focusing instead on proactive work instead of reactive measures, having a business law attorney on hand can make you aware of problems before they become big. With just a small amount of prevention and care, you can make your life and the providing for the well-being of your business significantly easier. Whether you have just started or you have run a successful business for years, having proper representation is crucial. So, why bother with a business law attorney? Well, business law attorneys can help protect you against prospective, current, and former employees from suing you on a number of different grounds like having a hostile work environment or discrimination. In addition, they can help to mediate complaints and lawsuits from multiple organizations, including federal, state, and local governments. At the same time, they can ensure that all business operations are within the law and that things like special allocations as well as LLC agreements are handled correctly. 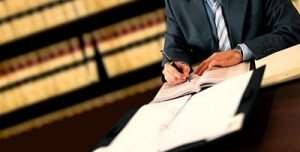 A business law lawyer can also help in highly specialized situations, like when there is an environmental problem that existed prior to your operation for which you are being blamed for or when negotiating the purchase or sale of assets. Regardless of your needs, choosing the right business attorney is crucial. With countless years of experience, let us represent your company. Representing companies, we understand the unique challenges that face you on a day-to-day basis. We are aware of problems that can develop when running a business as well as legal ways to resolve these problems and maximize the benefit to your company. Our team of business law attorneys will ensure that problems are solved before they become a big deal and help ensure the continued health of your company for years to come. Contacting our law firm today and we can discuss the needs of your company as well as how we can help you.